Among men, blacks have lowest well-being in U.S.
WASHINGTON, D.C. -- Among U.S. men, blacks have lower well-being than non-blacks, particularly among young men and seniors, according to the Gallup-Healthways Well-Being Index. Black men under the age of 35 have a Well-Being Index score that is at least one point lower than all other groups, a deficit that is statistically significant. These findings are based on nearly 98,000 interviews with American men aged 18 and over, from Jan. 2-Dec. 30, 2014, conducted as part of the Gallup-Healthways Well-Being Index. Young black males as a group have higher unemployment, lower graduation rates, less access to healthcare and higher incarceration rates than other racial, age and gender groups in the U.S. And in 2014, the particular difficulties this group has in dealings with law enforcement became headline news after events in Ferguson, Missouri, and Staten Island, New York, occurred involving the death of certain young black men at the hands of police. This article explores young black males' well-being, compared with other groups. 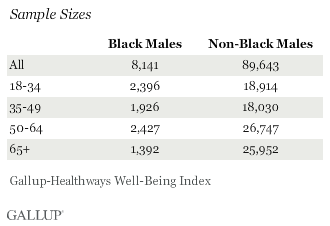 The Well-Being Index among black men aged 18 to 34 averages 59.1, 1.8 points lower than the average among all non-black men. The difference is 1.9 points for black men over the age of 65. Among those between the age of 35 and 64, however, there is little difference because blacks and whites in this age range have similar well-being scores. Asians and Hispanics report the highest levels of well-being among men nationally. Asians in particular hold the highest well-being in every age group, while Hispanics are second-highest in every age group except the over 65 group, where they are surpassed by whites. Within each racial group, senior citizens have the highest well-being of all age categories. Among blacks, Asians and Hispanics, well-being is also higher among those between the ages of 50 and 64 than among those less than age 50. In contrast, the youngest white males have higher well-being than white men of middle age. Similar to well-being generally, young black males' general outlook on their lives is particularly worse than what is reported by young males who are not black. 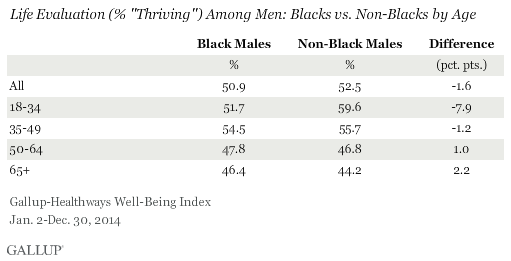 Gallup finds 51.7% of black males ages 18 to 34 rate their life situation well enough to be considered thriving, compared with 59.6% of non-black males in the same age range. There are much smaller differences in life evaluation between blacks and non-blacks at older ages. Also noteworthy is that young black males evaluate their lives worse than black males aged 35-49, a pattern not found across age groups among all U.S. adults or among non-black males, where life evaluation typically is lower among older age groups. Gallup and Healthways classifies Americans as "thriving," "struggling" or "suffering," according to how they rate their current and future lives on a ladder scale with steps numbered from 0 to 10 based on the Cantril Self-Anchoring Striving Scale. Those who rate their present life a 7 or higher and their lives in five years an 8 or higher are classified as thriving, while those who rate both dimensions a 4 or lower are considered suffering. Respondents whose ratings fall in between are considered struggling. Race and ethnicity is associated with well-being for both men and women, as is age. Among all Americans, well-being is higher for young adults than for middle-aged adults, before peaking among seniors. This general pattern is broken among blacks, as the life evaluation of young black men trails that of black men aged 35 to 49. These findings come at a time when Americans' satisfaction with race relations in the U.S. is sharply lower than what was reported in 2008. In addition, disproportionately high incarceration rates of young black males in the U.S. could potentially result in overestimating their already lower levels of reported well-being, as only non-incarcerated respondents are reached in the ongoing Well-Being Index. Black men face many challenges in American society. The official unemployment rate for black men is 10.4%, double the rate of 5.2% found for men generally. Amidst the jobs deficit, one-quarter of young black men report that they are treated unfairly by police because they are black, higher than what is reported by black women of their age group or older black men. The well-being shortfall reported by young black men stems from, but also adds to, these challenges. Well-being among populations is related to employment, healthcare utilization, crime, high school graduation rates, poor mental health, and life expectancy among other outcomes. As leaders of communities continue to discuss ways to help the lives of its citizens, embracing principles of well-being can serve as a critical contribution to this conversation. For young black males in particular, substantially lower well-being also represents a clear opportunity for leaders to make improvements in this arena. John Hope Bryant, CEO of Operation Hope and a noted thought leader focused on the challenges facing black men in American society today, adds, "There are a myriad of factors that contribute to why young black men's suffering index is so high, but what matters most today -- and for our collective American future -- is what we do about it in the here and now. And going forward, what every young person in the world wants is a positive expression of what we call 'their life aspirations.' What is needed now are for policy makers, business leaders, thought leaders and community leaders to take this data, and to stand up a Call To Action 3.0. Our lives -- and our collective future -- literally depends on it." Results are based on telephone interviews conducted as part of the Gallup-Healthways Well-Being Index survey Jan. 2-Dec. 30, 2014, yielding a random sample of 97,784 adult men, aged 18 and older, living in all 50 U.S. states and the District of Columbia, selected using random-digit-dial sampling. For results based on the sample sizes noted below, black respondents for each age category will have a maximum expected error range of about ±2.7 percentage points (life evaluation) and ±0.8 index points (Well-Being Index) at the 95% confidence level. Non-black respondents, in turn, will have a maximum expected error range of about ±0.8 percentage points (life evaluation) and ±0.2 index points (Well-Being Index) at the 95% confidence level. More Americans rated their lives positively enough to be considered "thriving" in life evaluation in 2014 than have since tracking began in 2008. But blacks, Asians and young Americans were no more likely to be "thriving" in 2014 than they were in 2013. Black Americans have consistently held more negative views of the police than whites, providing context for understanding the continuing protests resulting from the controversial death of Michael Brown in Ferguson, Missouri.